When I wrote the original Green Consumer Guide there was one question I was unfailingly asked by journalists. It was ‘if there’s one thing that you can do to save the world what would it be?’ Answer that in a sound bite without sounding trivial… Of course there isn’t just one thing there are lots of small things we should be doing – and lots of small solutions. Now the question I’m asked most often is ‘what’s the point of us changing what we do when China and India are consuming so much’. Sure enough this issue was raised both in my session at the Hay-on-Wye book festival (which I did along side Guardian journalist Leo Hickman) and at a later session I attended with Australian ecologist Tim Flannery. My answer has 3 parts. The first point is that we produce about 4-5 times more CO2 per head than they do in China (and America produces about double what we do). This makes it even harder for us to preach to China that they should cut emissions without us cutting our own. It would be a bit like asking someone to eat less when they have only one meal every two days, whilst we go on eating 3 meals a day without compunction. Finally, we should understand that rapid development in China doesn’t necessarily mean it will go through all the polluting stages that we have since the Industrial Revolution. We should be hoping that they’ll be leap-frogging the dirtiest stages of development. Take a mobile phone, for example. Nowadays you can use it to play music and games, take photos, email, measure your diet, keep a diary and a whole host of other things (even warn you when PMT is due!). This one small gizmo replaces many other bigger pieces of equipment – and therefore uses less resources. Tim Flannery didn’t just talk about China. He showed his frustration with the Australian Government, particularly in the face of a real crisis in both Adelaide (severe drought) and the Murray Darling river (which is drying up). The Australian Prime Minister, Flannery says, exhorts the public to ‘pray for rain’, whilst refusing to sign up to the Kyoto agreement. Talk about fiddling whilst Rome burns – or in this case Adelaide. At the Hay Book Festival they weren’t praying for rain. I was there on the last day when it was moderately sunny. 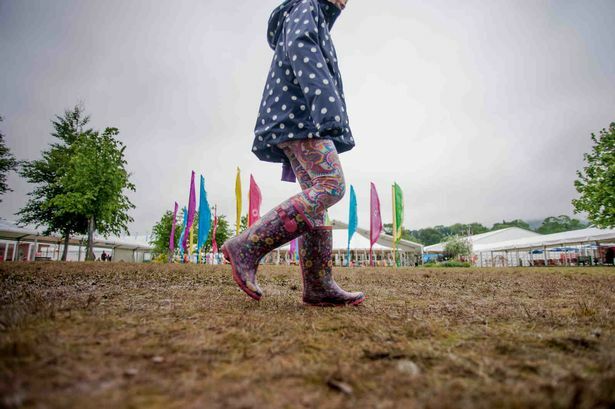 But there were signs all over the place of a very muddy start to the event – despite lots of discussion about climate change and droughts, it was a wet in the Welsh hills….. This entry was posted in BLOG, Energy & Climate, Media & Communications, News 2007, Speeches & Events, Writing. Bookmark the permalink.